The 39-year-old shared a selfie of himself dressed in a visitor’s gown at a hospital in Taiwan, waiting to enter the delivery room. 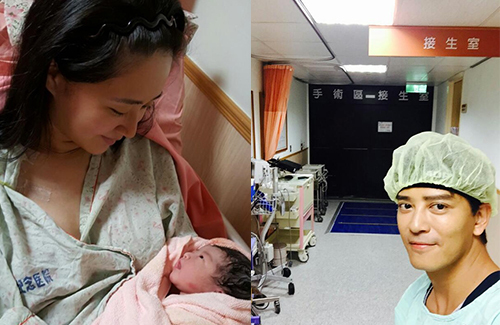 He also shared a picture of his wife, former model Wang Yu Hsien (王妤嫻), holding the newborn girl in her arms. The baby is looking up at her mother, smiling. Daniel married Yu Hsien, who is 12 years his junior, in a humble wedding ceremony back in early 2014. That summer, Daniel announced the birth of his first daughter, Kathelyn Chan (陳芷霖). In April 2015, while attending a public event, Daniel revealed that his wife was pregnant again. Yu Hsien was said to be due late August, but their little girl, who was seven and a half pounds at birth, decided to greet the world a few weeks earlier. Daniel and Yu Hsien then flew to Taiwan a few days earlier than planned, and stayed at the same hospital where Yu Hsien delivered Kathelyn. Did Daniel gone under the knife? His eyes are different from what I remembered.